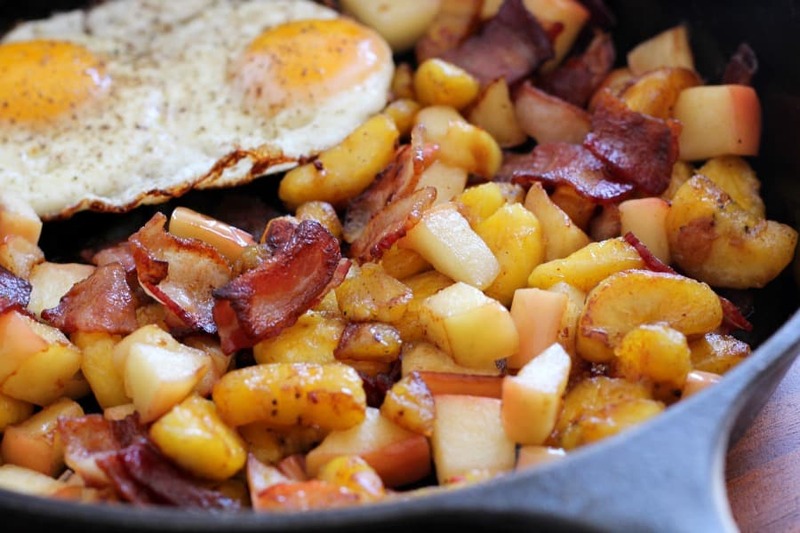 This sweet plantain apple bacon breakfast hash is sure to become your new favorite! 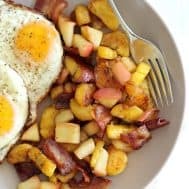 Crisp and sweet pink lady apples and ripe plantains are caramelized, and and cooked with sugar free bacon for a breakfast that’s full of flavor and nutrition. 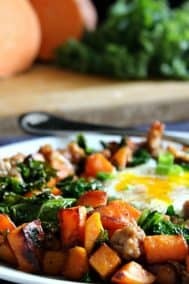 It’s Paleo and Whole30 friendly as well as super easy to make! 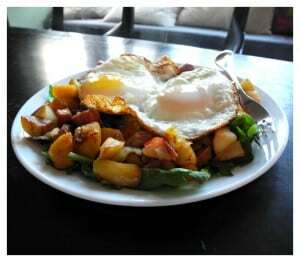 For me, a good hash topped with a couple of eggs cooked over easy is the ultimate comfort food lately. Breakfast lunch dinner, it doesn’t matter, it works for anything. When I first started cooking with apples, I didn’t realize that different types of apples taste, er, different, when exposed to heat. Nevermind the signs in the grocery store telling you right there in plain English which ones are good for snacking versus cooking. I just thought they had nothing better or more interesting to say about the apples so they felt like categorizing them based on some possible uses. I didn’t realize that some apples that taste amazing eaten fresh suddenly taste bitter and weirdly textured once cooked. I had to learn that the hard way, just like I learned everything else I know about cooking. Make stuff that tastes horrible and then fix it. And keep on fixing it until it tastes great. 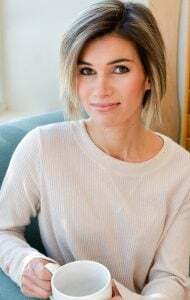 The willingness to experiment is what ultimately taught me how to create my own meals that somehow wind up being good. My mom thinks I have a talent for cooking. No, mom, I don’t, I’ve just put a lot of painstaking time and heartache into figuring out what is worth serving and what to pretend never happened. Like cooking a fuji apple. Some things in cooking just don’t work. It just means you have to try, try again. Okay so where was I…pink lady apples. I have found that I like the way these cook up, crisp and they keep a pretty sweet taste. 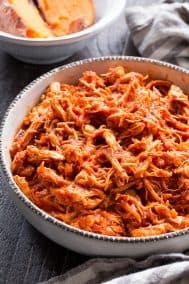 I think granny smith could also be used in this recipe as well. You want something with a pretty strong sweet-tart flavor. Here we go! 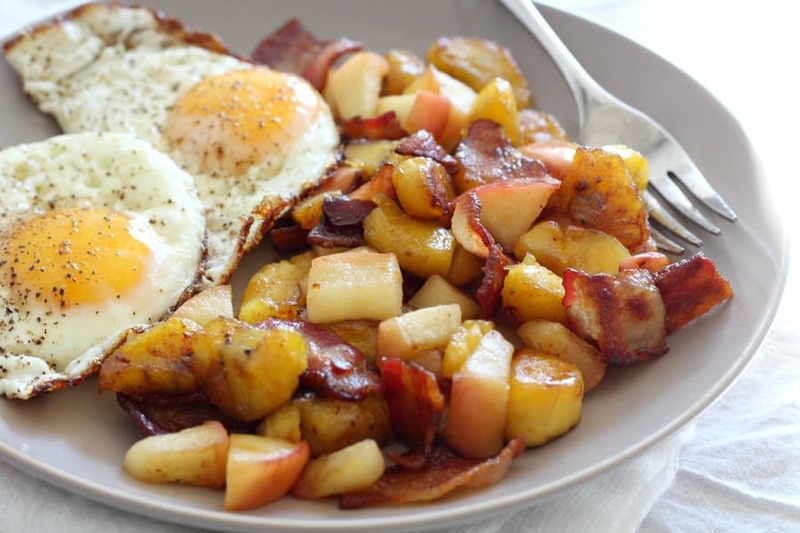 A sweet plantain apple bacon hash featuring sweet crisp pink lady apples, caramelized plantain, and sugar free bacon. 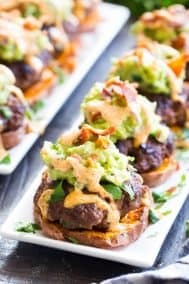 It's paleo, whole30 friendly, and easy to make! Heat a medium heavy skillet over med-hi heat. 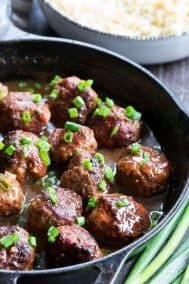 Cut the bacon into bite-sized pieces and add to the pan. While the bacon begins to brown, peel your plantain and cut it into bite-size pieces. When the bacon is halfway done, stir it a bit and then add the plantains. Stir while cooking to allow the plantains to caramelize on all sides in the bacon fat. 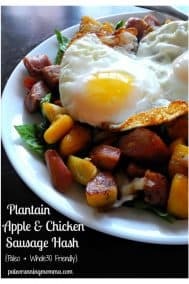 Once the plantains are getting brown and soft, add the apples (and onions, if including) to the pan and stir. Lower the heat to medium or medium-low, and cover the pan to allow the onions and apples to cook. After less than a minute, uncover and stir. Add the salt and cinnamon and continue cooking and stirring. 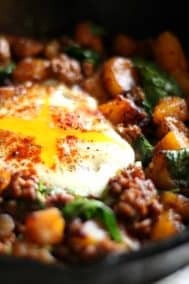 Once the mixture is nicely browned and the apples and onions are soft and lightly browned, add the eggs one at a time on top of the hash. 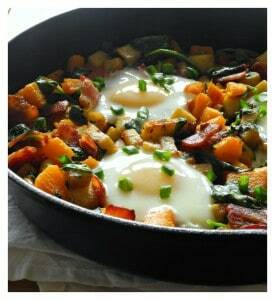 If you've topped with eggs, cover the pan and allow the eggs to cook to preference. 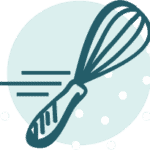 If you want the yolks creamy, stop cooking once the whites are completely done but the yolks are still in place. Done! Serve warm and enjoy! 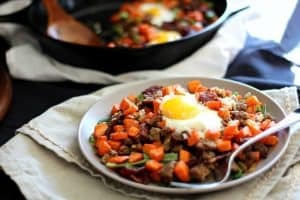 Check out these other breakfast hash recipes that I know you’ll love! Yay! Hope you tried it! I’ve never cooked with apples before, so that is good to know! 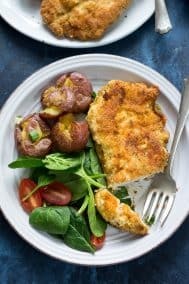 I didn’t realize that some were better for cooking than others.This dish looks great! Yup, texture and the right tart/sweet mix is important! If you can’t get pink ladies granny smith works well for everything. I can’t wait to make this!! Weird question but I have a cast iron saute pan that I love to use, but when I bought it it didn’t come with a lid or cover. Do you have a cast iron skillet you use that came with a cover? Where did you find it? Or, do you know of a separate lid I could buy? 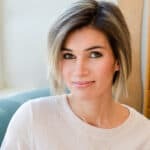 Thanks and LOVE your blog!! My cast iron didn’t come with a lid but I have a collection of various lids that fit different sized pans from all the ones I’ve had in the past that did come with lids 🙂 In my experience, the lid doesn’t have to fit perfectly, as long as it’s good enough and heat proof it will work! Ooh that sounds yummy! Glad you liked! 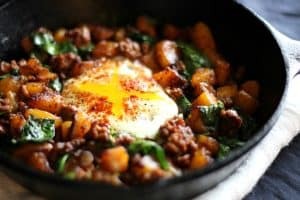 How well does this hash reheat? I’d like to be able to reheat for busy school mornings & just fry up an egg or two to go up on top. Thanks! I’m having a hard time deciding which hash to try first but since I have ripe plantains I thought I’d go with this! Just wanted to say that I absolutely love this dish. I have made it at least 20 times and it is so delicious. It makes for such an impressive brunch when we have company and sometimes it is dinner! Absolutely perfect! This recipe is one of my favorite things to make. I always double it for lots of leftovers! Oh my gosh so good. 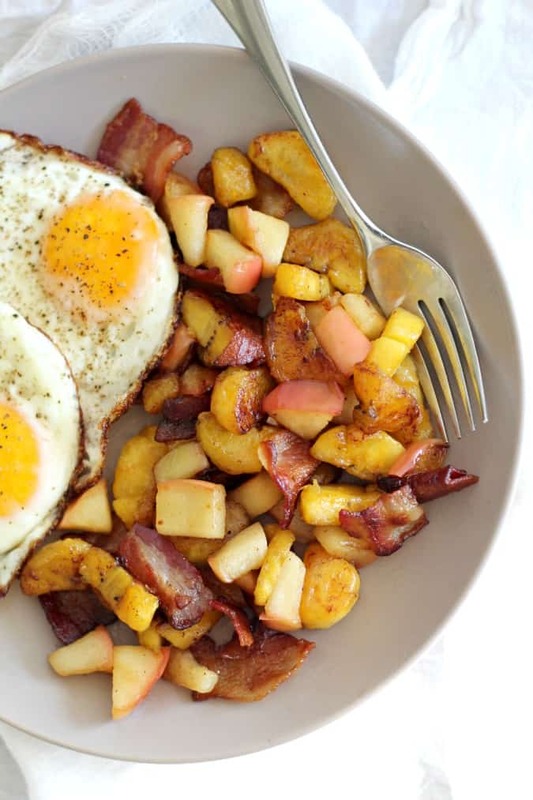 We used a little less bacon, a Granny Smith apple, and fried the eggs in a separate pan so mine and my daughters could be a little more solid. 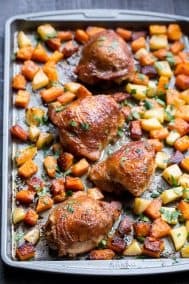 It was so good my husband requested I prep the veggies and fruits as much as possible and freeze in single serving baggies so we can have everything ready for quick mornings 👏…. and this from my strictly biscuits and gravy no-new-meals man.